"Caergybi" redirects here. For other uses, see Caergybi (disambiguation). 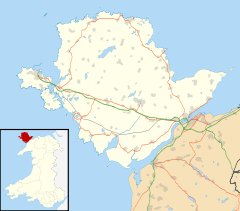 Holyhead (/ˈhɒlɪhɛd/ ( listen) HOL-i-hed; Welsh: Caergybi [kɑːɨrˈɡəbi], "Cybi's fort") is a town in Wales and a major Irish Sea port serving Ireland. It is also a community and the largest town in the Isle of Anglesey county, with a population of 13,659 at the 2011 census. Holyhead is on Holy Island, which is separated from Anglesey by the Cymyran Strait and was originally connected to Anglesey via the Four Mile Bridge and now by the Stanley Embankment. In the mid-19th century, Lord Stanley, a local philanthropist, funded the building of a larger causeway, known locally as "The Cobb", it now carries the A5 and the railway line. The A55 dual carriageway runs parallel to the Cobb on a modern causeway. The town centre is built around St. Cybi's Church, which is built inside one of Europe's few three-walled Roman forts (the fourth boundary being the sea, which used to come up to the fort). The Romans also built a watchtower on the top of Holyhead Mountain inside Mynydd y Twr, a prehistoric hillfort. Settlements in the area date from prehistoric times, with circular huts, burial chambers and standing stones featuring in the highest concentration in Britain. The current lighthouse is on South Stack on the other side of Holyhead Mountain and is open to the public. Soldiers Point Hotel, located near the breakwater park in Holyhead was first established in 1848. It was the residence of an engineer that was in charge of the government sponsored alterations to Holyhead Harbour being carried out. It has been considered some what of a tourist attraction, except it has been blocked off for safety reasons and people seem to view it as an 'Urban Exploration' building. The Port of Holyhead has a busy ferry port. Stena Line, Northern Europe's biggest ferry company, operates from the port, as do Irish Ferries. Ferries sail to Dublin, in Ireland; this forms the principal link for surface transport from central and northern England and Wales to Ireland. There is archaeological evidence that people have been sailing between Holyhead and Ireland for 4,000 years. Holyhead's maritime importance was at its height in the 19th century with a 1.7 mile (3 km) long sea breakwater. Holyhead Breakwater is the longest in the UK and was built to create a safe harbour for vessels caught in stormy waters on their way to Liverpool and the industrial ports of Lancashire. Holyhead's sea heritage is remembered in a maritime museum. The post road built by Thomas Telford from London strengthened Holyhead's position as the port from which the Royal Mail was dispatched to and from Dublin on the Mail coach. The A5 terminates at Admiralty Arch (1822–24), which was designed by Thomas Harrison to commemorate a visit by King George IV in 1821 en route to Ireland and marks the zenith of Irish Mail coach operations. Holy Island and Anglesey are separated by the Cymyran Strait which used to be crossed on the Four Mile Bridge; so called, because the bridge was 4 miles (6.4 km) from Holyhead on the old turnpike. In 2001, work was completed on the extension of the A55 North Wales Expressway from the Britannia Bridge to Holyhead, giving the town a dual carriageway connection to North Wales and the main British motorway network. The A55 forms part of Euroroute E22. The Anglesey section was financed through a Private Finance Initiative scheme. With the opening of the railway from London to Liverpool, Holyhead lost the London to Dublin Mail contract in 1839 to the Port of Liverpool. 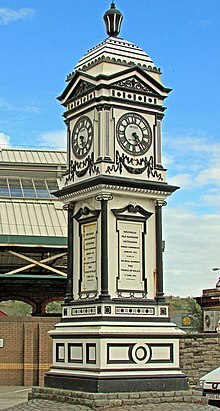 Only after the completion of the Chester and Holyhead Railway in 1850 and the building of Holyhead railway station did the Irish Mail return to Holyhead, operated from London Euston by the London and North Western Railway. Holyhead is the terminus of the North Wales Coast Line and is currently served by Virgin Trains and Transport for Wales services. Virgin Trains run direct trains to London Euston and Transport for Wales operate direct trains towards Cardiff and Birmingham International via Wrexham and Shrewsbury, and two direct trains per day to Manchester Piccadilly. The rail and ferry terminals are connected (for pedestrians and cyclists) to the town centre by The Celtic Gateway bridge. Until September 2009, Holyhead's main industry was the massive aluminium smelter on the outskirts of the town, operated by Anglesey Aluminium, a subsidiary of Rio Tinto Group. A large jetty in the harbour received ships from Jamaica and Australia, and their cargoes of alumina were transported on a rope-driven conveyor belt running underneath the town to the plant. The jetty is now used by Orthios to dock cruise ships visiting from all over the world. The jetty is wide enough for coaches to travel down to collect and deliver passengers to the town and on local tours. The plant relied for its electricity supply on the island's nuclear power station at Wylfa, near Cemaes Bay. However, Wylfa was reaching the end of its life and had permission to generate only until 2012, and the ending of a low-cost electricity supply contract in 2009 impacted on the financial viability of the smelting plant. Continuing operations involve the remelting of aluminium scrap for re-use. The site is subject to proposals by a development company called Orthios. Holyhead Port is a major employer, most of the jobs being linked to ferry services to the Republic of Ireland operated by Stena and Irish Ferries. Other significant industrial/transport sector employers in Holyhead include Holyhead Boatyard, Gwynedd Shipping, and Eaton Electrical, with the last of these having seen many job losses in 2009. New retail developments in recent years have been a major source of new job creation. Like the rest of the British Isles and Wales, Holyhead has a maritime climate with cool summers and mild winters, and often high winds exacerbated by its location by the Irish Sea. The nearest official weather observation station is at RAF Valley, about 5 miles South East of the town centre. On 23 November 1981, Holyhead was struck by two tornadoes during the record-breaking 1981 United Kingdom tornado outbreak. One of the tornadoes, rated as an F2/T4 tornado, was the strongest recorded out of 104 tornadoes in the entire outbreak, causing damage to around 20 properties in Holyhead and destroying a static caravan site. Holyhead Town Council is the town's community council, comprising sixteen councillors elected from the seven community electoral wards. For elections to the Isle of Anglesey County Council, the Caergybi electoral ward covers the majority of Holyhead and elects three county councillors every four years. In May 2017 the ward elected a Labour Party candidate and two Independents. Captain John Macgregor Skinner (1761–1832) moved to Holyhead from the US in 1793. Master on packet ships between Holyhead and Dublin but was washed overboard. The town erected an obelisk in his honour and his house is an exhibit at the Holyhead Maritime Museum. Donough O'Brien (1879–1953) a Welsh-born Irish cricketer. Gareth Evans (born 1986) weightlifter, Commonwealth gold medalist and 2012 Summer Olympics competitor lives in the town. Holyhead is the start and finish point of the Anglesey Coastal Path. Holyhead hosted the National Eisteddfod in 1927. Holyhead's arts centre, the Ucheldre Centre, is located in the chapel of an old convent belonging to the order of the Bon Sauveur. It holds regular arts exhibitions, performances, workshops and film screenings. The Holyhead Maritime Museum is housed in what is claimed to be Wales's oldest lifeboat house. The lifeboat station was established in 1828. According to the United Kingdom Census 2001, 47% of the residents in the town can speak Welsh. The highest percentage of speakers is the 15-year-old age group, of whom 66% can speak the language. According to the 2011 Census, of those in the community who were born in Wales, 52.2% of the population could speak Welsh. The town's main football team is called Holyhead Hotspur and they play in the Cymru Alliance, with their reserves playing in the Gwynedd League. The Holyhead Gwelfor Athletic play in the Anglesey League. Holyhead's cliffs are used for coasteering, a water sport which involves jumping off cliffs at different heights. Holyhead is home to one of the first churches of the Jedi Religion, founded by brothers Daniel and Barney Jones early in 2008. Holyhead High School (previously County Secondary school) was the first comprehensive school in the UK. Holyhead was officially twinned with Greystones, County Wicklow on 20 January 2012, and this is celebrated on a new road sign. Holyhead Sailing Club provides members with facilities for sailing and kayaking with swinging moorings, a dinghy park and a clubhouse with restaurant and bar. It is on Newry Beach in the historic port of Holyhead. Holyhead & Anglesey Amateur Boxing Club was founded on 1 April 2012, located in Vicarage Lane, Holyhead. The club is open to anyone over the age of 10, having a class for male and female trainees. ^ a b "Parish Headcounts: Isle of Anglesey". Neighbourhood Statistics. Office for National Statistics. Retrieved 15 March 2018. ^ "Wylfa to continue generating until 2012". Nuclear Engineering International. Archived from the original on 5 March 2012. Retrieved 13 December 2011. ^ "Holyhead factory closure could put 265 jobs at risk". North Wales Daily Post. 19 April 2013. Retrieved 26 May 2017. ^ "Valley 1981–2010 averages". MetOffice. Archived from the original on 12 August 2014. Retrieved 11 August 2014. ^ "Councillors". Holyhead Town Council. Retrieved 5 December 2017. ^ "Election results for Caergybi - Local Elections May 2017 - Thursday, 4th May, 2017". Isle of Anglesey County Council. Retrieved 5 December 2017. ^ "RNLI: Holyhead". Retrieved 16 February 2016. ^ "O'r rhai a anwyd yng Nghymru, % yn gallu siarad Cymraeg". Statiaith. ^ "BBC News article on Jedi church in Holyhead". 28 January 2008. Retrieved 19 October 2008. ^ Everett, Cliff (23 January 2012). "Twinning Oath Signed". holyheadtowncouncil.com. Holyhead Town Council. Retrieved 8 February 2012. Wikimedia Commons has media related to Holyhead. Wikivoyage has a travel guide for Holyhead.